It's been a really crazy couple of weeks. There have been visitors, family, travel, a dessert buffet and a whole lotta busy going on. Whilst it's been fun, my sleep and exercise regime have suffered. Amongst all this I decided to join the Daring Bakers and Daring Cooks challenges where a group of bakers & cooks come together once a month to try something new. I joined and waited for the February challenge to be released. To my surprise the challenge involved baking two different items. 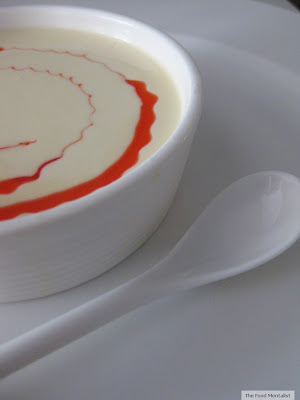 What a month to join I thought as I haunted various websites looking for unusual flavour combinations and ideas for my Panna Cotta. Every so often, we all bake or cook something and..... well........ It Fails! 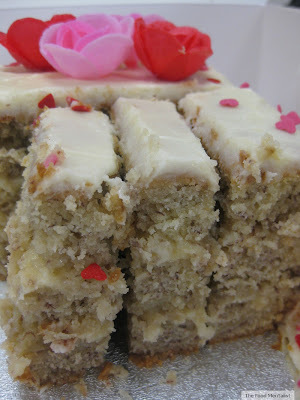 The February 2011 Daring Bakers' challenge was hosted by Mallory from A Sofa in the Kitchen. She chose to challenge everyone to make Panna Cotta from Giada De Laurentiis recipe and Nestle Florentine Cookies. We were given two recipes for the Panna Cotta, a vanilla one and a chocolate one. Looking at the vanilla recipe I wasn't sure I was going to like it. 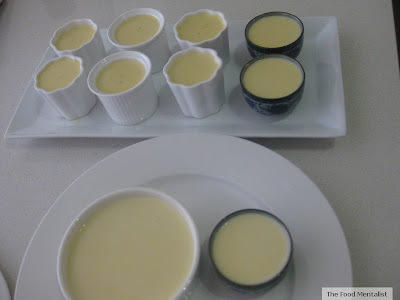 I have always made Panna Cotta using cream, sugar, vanilla and gelatine sheets rather than the milk/cream combo, honey and powdered gelatine the recipe called for. I should have heard the alarm bells bellowing then. But I went with it. I decided I would make the vanilla recipe rather than the chocolate one as I wanted to keep it simple, particularly since I was going to have to make cookies too. I also chose to make a rose water syrup to go with the Panna Cotta. I used gelatine sheets rather than the powdered gelatine the below recipe called for. For the Florentine cookies, we were able to choose the chocolate and add nuts if we wanted. I didn't add any nuts and chose to sandwich my cookies with dark chocolate as I find milk chocolate too sweet when it comes to most cookies. 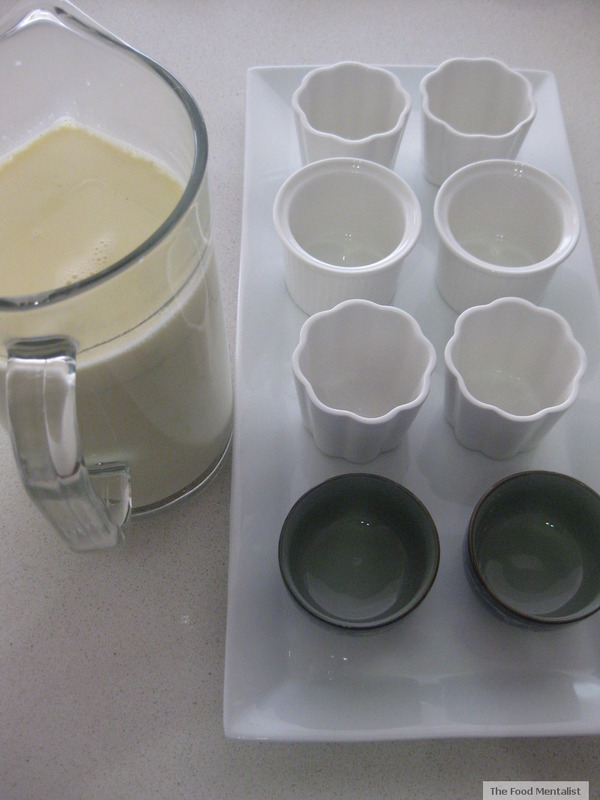 I made the Panna Cotta, poured the mixture into the ramekins, placed them into the fridge and started on the cookies. Drop a tablespoon full, three inches (75 mm) apart, onto your prepared baking sheet. 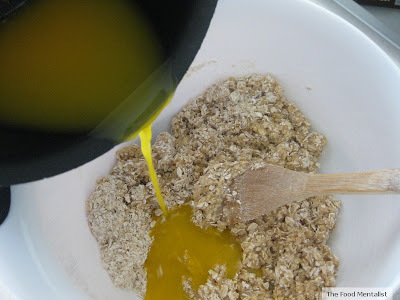 Flatten slightly with the back of your tablespoon, or use a spatula. 3. Bake in preheated oven for 6-8 minutes, until cookies are golden brown. Cool completely on the baking sheets. 4. 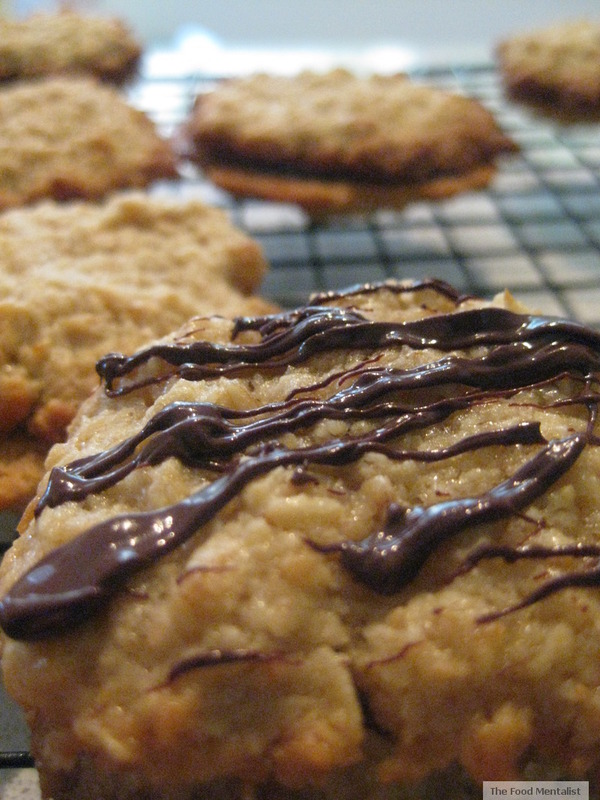 While the cookies are cooling melt your chocolate until smooth either in the microwave (1 1/2 minutes), or stove top (in a double boiler, or a bowl that fits atop a saucepan filled with a bit of water, being sure the water doesn't touch the bottom of the bowl). 5. Peel the cookies from the silpat or parchment and place face down on a wire rack set over a sheet of wax/parchment paper (to keep counters clean). 6. 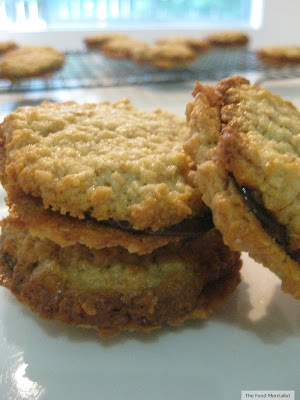 Spread a tablespoon of chocolate on the bottom/flat side of your cookie, sandwiching another (flat end) cookie atop the chocolate. The cookies turned out quite well. 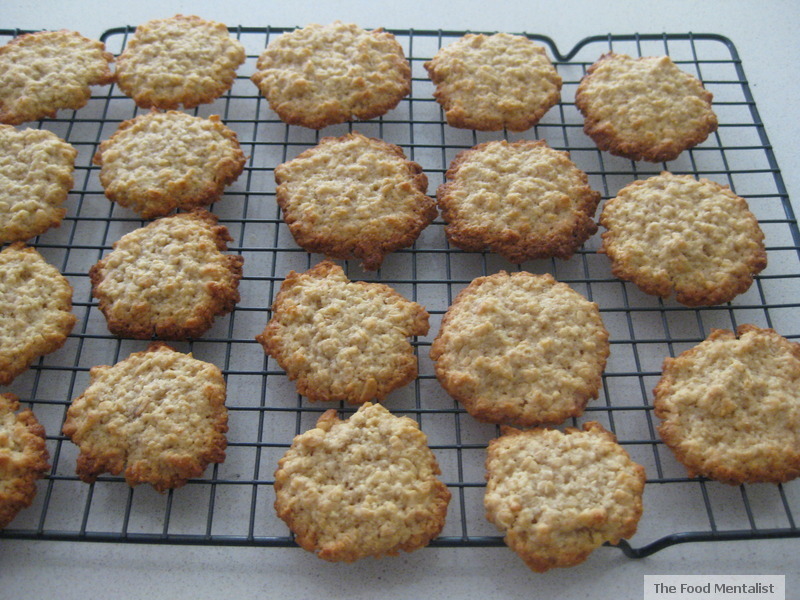 I had never made Florentines before and they are certainly a unique cookie. I'm glad I made and tried them but I don't think I will be in a hurry to make another batch. Give me a good choc chip cookie any day! Having made the cookies I turned my attention back to the Panna Cotta's in the fridge. It had been about 4 hours and I noticed they hadn't started to set. What the? I was expected at a family dinner in 2 hours and I was bringing dessert - The Panna Cotta's . It was too late to make a fresh batch and besides I was out of ingredients. The cookies would have to suffice. In a crazy attempt to salvage the PC's I placed them into the freezer for an hour whilst I got ready. Result - An Absolute Debacle! They didn't set and I was really disappointed.It was apparent that in my baking fury I had added the usual amount of gelatine required for my own PC recipe and had forgotten to adjust it to accommodate for the extra liquid in the new recipe - the milk. Up until this point I had never had a problem with making PC's. I was actually relieved when I first read the challenge because I consider it one of my easiest and favourite desserts. Moral of the story - If you have a tried and tested recipe that you use on a regular basis, don't adapt it, don't try a new one, just stick with it! One positive was that I made a killer rose water syrup, and I will be definitely adding it to future cooking endeavours. As a bonus it was super easy! I think it would be great drizzled over a good quality vanilla bean ice cream too. 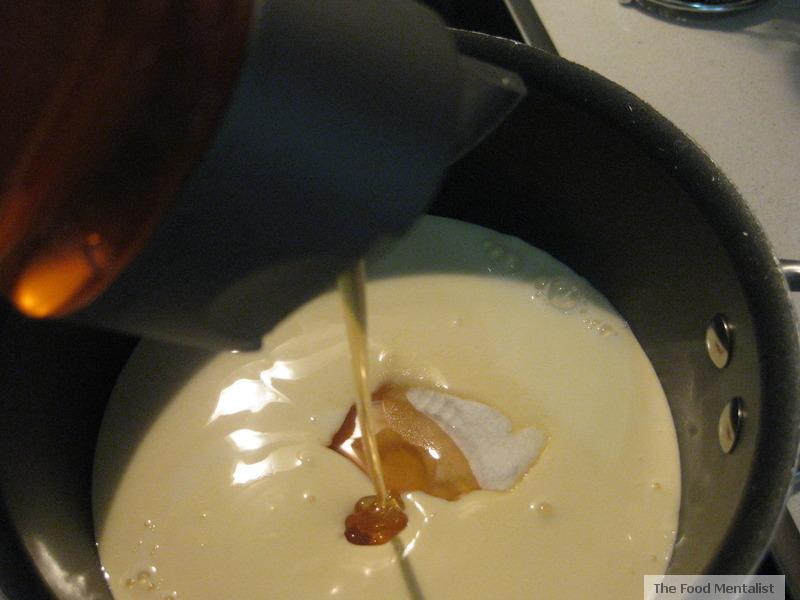 Add all 3 ingredients to a saucepan and stir over medium heat until sugar dissolves. Gently bring to a simmer and reduce heat. 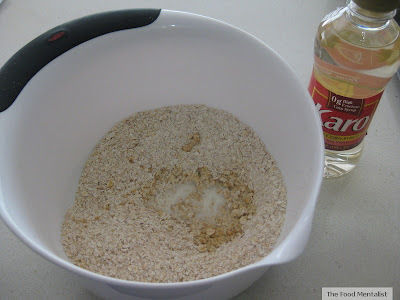 Stir it now and again until you reach your desired consistency. I wanted mine to be quite thick and syrupy so I kept it on the heat for about 15 minutes stirring occasionally. Do be careful though because it gets REALLY hot! It stillls looks beautiful, great idea to pair it with rose. It probably still tasted great! 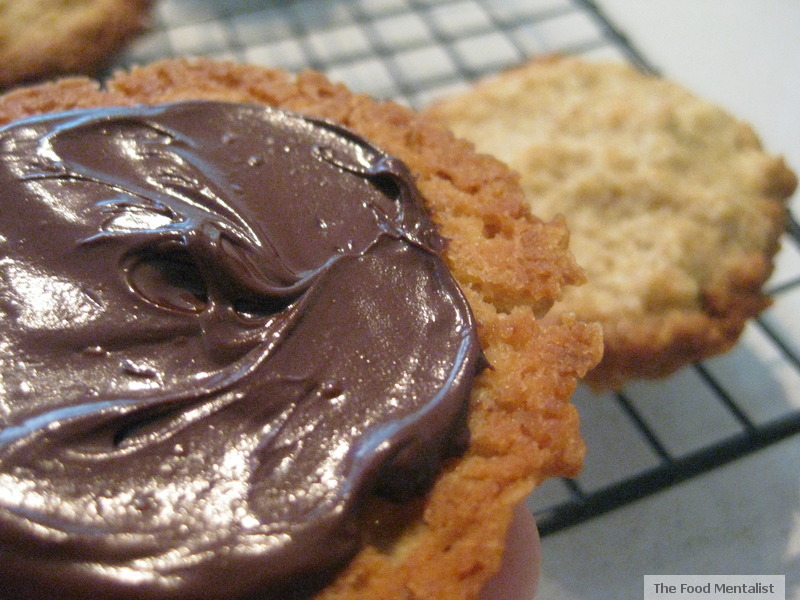 And your florentine cookies look somewhat delicious, especially with that chocolate on top!